For iPhone users, we know you need this in your iPhone! 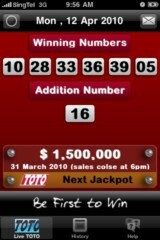 We love iPhone too, and thus we bring to you a nice LiveToto iPhone App! Check out instructions on the right and get this into your iPhone now! 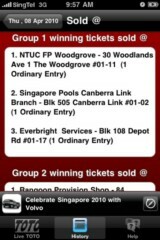 There are more functions, like TOTO history, SMS/Email Result in our mobile LiveTOTO app. Open up your iPhone browser, surf to http://live4d.sg, and click the download link, we will bring you direct to iPhone app store to download our app. Open up App Store in your iPhone, search for "Live TOTO". Yes, if you see the little Red TOTO icon with a red "LIVE", thats us. If you have iTune installed, you can also click this link to download. Copyright © 2010 Live4D. Live4D bring to you by http://live4d.sg.